Smith & Wellstood's Glasgow Warehouse Employees v Grasshoppers - Owing to the undecided manner in which the match on the 18th inst. was finished, these two teams arranged to meet again on the 25th inst., when the final contest for superiority took place. The game, which was a decided improvement on the last, both with regard to the individual and combined play of the teams, was played on the "Rovers'" field, Glasgow, they having kindly lent it for the occasion. The ball was kicked off at 3:15, and was for some time kept in the centre, till the Grasshoppers' forwards got away with it, when, after some neat passing and dribbling by Mitchell and Clarke, the latter succeeding in scoring a goal. On the ball being again kicked off, the Glasgow men settled well to their work and tried their utmost to equalize the game, but their efforts were vain, for again their opponents' forwards got the ball amongst them, and after a good run down the field Dobson centered the ball and Clarke skillfully shot it through below the tape, thus scoring goal number two. Ends having been changed, with the wind in their favour, the Glasgow forwards Laine, Smith, and Todd, made some capital efforts to score, but without success, the ball always being returned from the feet of king and Lapsley. The game thus ended in a win for the Grasshoppers by two goals to none. Besides those before mentioned, Paterson, Ure, and Smith for the Grasshoppers, and Smith, Bell, and Marshall for Glasgow did good work for their respective sides. After the match the strangers were hospitably entertained to a substantial dinner and tea by the Glasgow team, and a most enjoyable evening was spent. Bonnybridge Grasshoppers v Smith & Wellstood's Employees, Glasgow - These two teams met on the ground of the former on Saturday last, and a well contested game was the result. Up till half-time neither side succeeded in scoring, and it was thought that the game would be a draw, but, as the end approached, the Grasshoppers redoubled their efforts, and succeeded in securing a goal about five minutes before time was called. The goal was, however, disputed by the strangers for a time, but, on seeing that they were wrong, several of those who "had a right to know" gave in; though several others maintained that a foul had occurred before the goal was taken. Lane, Smith and Todd, for the strangers, and Clarke, Mitchell and Paterson for the home team played well through the game. In my ongoing attempt to cover early football in Central Scotland I have to cover some of the really early matches about which, it sometime seems, I am the only person that has any interest, but, the sooner I do it, the sooner I can get on to the later stuff. This match was part of the first 'derby' in Stirlingshire, in effect the "Bonnybridge Derby". It would seem that the first match is lost, but luckily was referred to in this report [which is a shame because the Greenhill side won the first game]. Football- Midland Club v Grasshoppers - This match was played on Saturday on the ground of the former at Greenhill. The ball was kicked off at 3:30, and was kept well in the centre of the ground for a time, until Watson got away with it, and after some skillful dribbling, passed it to Marshall, who scored a goal for the Midland. On the ball being again kicked off, Mitchell and Clarke carried it well up to the Midland goal line, but failed to put it through. The ball was kept constantly going from one goal line to the other till half-time, both teams playing well, and their utmost to score. On ends being changed, the Grasshoppers' forwards got the ball well down into their enemy's quarters, and in spite of the efforts of Watson (who dribbled well, but always found Glaister at his post and one too many for him), they kept it there, and succeeded in scoring two goals before time was called, their own goalkeeper only once handling the ball after half-time. Besides those already mentioned, Mackie, Fotheringham, and Murray for the Midland, and Lapsley, Crombie, McPhie, and Paterson for the Grasshoppers played well through the whole game, which was witnessed by a large company. The Grasshoppers showed a decided improvement since their last match with the Midland (which they lost by one goal and two disputed to none) both in their style of playing and the position of their men, which added greatly to their success." In the mid 1870s football reporting at a local level was very rare, local papers did not really report on away matches, and a lot of the football was simply a scoreline, so it is delightful to find the occasional match that was reported in full. This match was Grasshoppers second match for which any evidence survives and of course the club they were playing had nothing to do with Airdieonians. This match came off on the ground of the former at Bonnybridge on Saturday last, and resulted in a win to the Airdrie team by two goals to none. The superior weight of their opponents, and the manner in which they used this advantage, made up for the loss of one of their men, and rather astonished the home team, who - this being their first match with any regular club - were entirely unacustomed to such rough handling, and were often unexpectedly "floored" by their opponents when the ball was at another part of the field. As soon, however, as they saw the aim of their antagonists they began to watch better, and after the first quarter of an hour the game was very well contested, though rather in the favour of the Airdrie team throughout, both sides exerting themselves to their utmost. At about ten minutes to time the second goal was scored for Airdrie - the first having been taken within ten minutes of the kick-off. For Airdrie - H.Hendrie, J.Skelton, J.Laird and J.Mulvey; and for the Grasshoppers - H.Lapsley, J.Mitchell, J.Roscoe and J.Glaister played well throughout the whole game. As the Grasshoppers turned out in their new uniforms - red, white and black jerseys - which showed well against the blue jerseys of their opponents - white knickerbockers with green strip and red stockings - the field presented a very bright appearance, and the day being fine, the game was witnessed by a large number of spectators. The following are the teams :- Airdrie - Goal-keeper, H.Kenny; back F.Skelton; half-backs A.Diamont, J.Skelton; forwards C.Docherty, H.Hendrie (Captain), J.Mulvey, W.Skelton, J.Laird, J.Delaney. Grasshoppers - Goal-keeper, M.Dobson; backs J.Glaister, J.Roscoe; half-backs R.Dobbie, W.Crombie; forwards A.Lapsley (Captain), J.Clarke, J.Mitchell, T.Smith, H.McPhie, W.Forrester. The first Scottish Cup match played by a team from Falkirk District, in fact from Stirlingshire, was played in Edinburgh of all places. I believe that back then the early rounds of the Scottish Cup were regionalised, so the fact that Grasshoppers were in the Edinburghshire group shows the lack of football in Central Scotland. 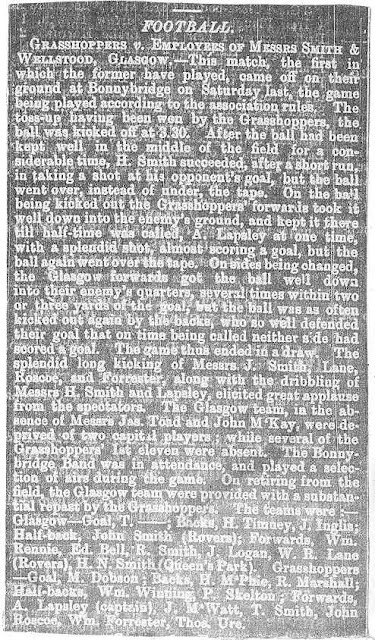 The match itself was probably played on the Meadows [or perhaps Bruntsfield Links], and was the first match of the season for the Grasshoppers. They lost. It was their only competetive game. The teams had a strange relationship with competitions back then. From the Falkirk Herald Thursday 5th October 1876. These two clubs opened their seasons on Saturday by engaging in an Association Cup tie. The Grasshoppers, who hail from Bonnybridge, took the defensive first, and the Edinburgh team kicked off with the wind favouring. The visitors, although looking heavier than their opponents, were well pressed, and the play was pretty often in their quarters. In the second three-quarters, when ends had been changed , the forwards, whose strength was somewhat increased by an influx of members from the defunct Heart of Mid-Lothian got well in, and T.Purdie kicked a goal. This, although the play still went on, practically decided the tie. Teams:- St Andrews - Messrs R.Winton, goal; G.Purdie and D.Grosset, backs; R.Purdie and R.Rolly, half-backs; D.Ross, D.Brunton, T.Purdie, J.Cochrane, G.Mitchell and J.Alexander, forwards. Grasshoppers - Messrs T.Ure, goal; A.Lapsley and J.King, backs; J.Paterson and W.Anderson, half-backs; T.Smith, H.Macfie, W.Crombie, W.Forester, J.Mitchell and J.Clarke, forwards. Back in the day, before your internets, and before your mass media, the only way to find about anything was to be there or to be able buy one of the few publications about it. These days we can google this or that and find out in a flash the sum of human knowledge [which some idiot has been bothered to put on the internet] about whatever subject you want. Not so at the start of the 1880s when the only sources of info about football clubs was the local press and the SFA handbooks. This sadly comes from the season just before East Stirlingshire joined the SFA so are excluded, but this is a very interesting insight into local football from the season 1880/81. Founded in 1877, 50 members. Grounds - Private: Blinkbonny Grounds - 15 minutes drive from the station. Dressing Room - Crown Hotel. Colours - Blue & White. Last Year - Played: 26 matches - won 13, lost 7, drawn 6, obtained 38 goals, lost 25 goals. George Richardson: Hon & Match Secy. Formed 1875, 30 members. Grounds - Private: Bonnyside, Bonnybridge - 15 minutes walk from Greenhill Station, NBR. Dressing room at ground. Colours - Red Jerseys & Stockings, White Knickers. Last Year - Played: 11 matches - won 4, lost 4, drawn 3, obtained 22 goals, lost 25 goals. William Reid, care of Singer Manufacturing Coy., Bonnybridge: Hon & Match Secy. Thanks to Forrest Robertson for looking this up! NB - I hope you note my silence of the foundation date of Falkirk FC published within 5 years of said foundation!!!!!!! A couple of years before people got round to playing 'the Association Game' in the town of Falkirk, a couple of miles to the West football in the County of Stirlingshire began in the form of the Grasshoppers from the now unlikely location of Bonnybridge. I say unlikely because Bonnybridge is little but a local identity these days. It has since the war been amalgamated into a sprawl of former villages between Falkirk and Cumbernauld [encompassing, Bankhead, Banknock, Bonnybridge, Denny, Dennyloanhead, Dunipace, Fankerton, Greenhill, Head of Muir, Longcroft & Milnquarter [the Metropolis of Greater Herbertshire as I have decided to call it]]. The borders are still signposted, but few other than the locals know where one place ends and the other begins. But in 1875 the situation was far from this. Bonnybridge was the only one of these villages which straddled the Forth & Clyde Canal and it was for this reason that Smith & Wellstood's, the Glasgow Stovemakers, decided to build a foundry [the Columbian Works] just to the South of the Canal, soon to be followed by Singer's [the Sewing Machinists]. This had two main impacts on the village, it helped take the focus away from Falkirk in terms of trade, and more importantly, it brought workers from the city. Tradition has it that in the Autumn a group of workers met in the library of the Columbian Works Halls and decided to form a football team, writing to their boss H.N.Smith of Queen's Park FC [Scotland's referee in the first ever international], to send them a ball and a copy of the association rules, and that was that. Within months they were playing a team from the firm's Glasgow Warehouse and football had begun in Stirlingshire. 'The Falkirk Herald' Edition - Thursday October 21st 1875. NB - The only reason that I can think of as to why they chose the name 'Grasshoppers' is because sand for the moulds in foundries was moved about in big Hoppers, but that is just a guess on my part. This match came off on the ground of the former on Saturday last, and resulted in favour of the Stirling team by 2 goals to 1. the play of both teams was excellent. Teams:- Grasshoppers - goal, Alex. Brown; backs, James Paterson and Alex. Paterson; half-backs, Messrs. Irvine and Gardiner; forwards, Hamilton (captain), Mitchell, Cherry, Smith, Moffat, and Crombie. King's Park - Goal, W.Wordie; backs, J.Shaw and W.Gentles; half-backs, J.M'Laren and J.Leishman; forwards, W.M'Beath, J.M'Kay, J.M'Donald, P.Lennie, D.Stewart, and J.Oliphant (captain). This match came off on Saturday last on the ground of the former at Randyford. Owing to this being the first draw for the association cup, great interest was manifested by the large number of spectators who appeared on the ground - there being about 400. The home team won the toss, and played off with a little win in their favour, pressing the strangers' goal, evidently determined that their first essay for the cup would be a success. After some hard playing on the part of both clubs, half-time was called with one goal and a disputed one to the credit of Falkirk. The ends now being changed, the wind by this time blowing stronger than the first half, was more favourable to Bonnybridge, who, taking the advantage of this, played with a vigour, seemingly resolved to retrieve lost honours; but the "bairns" showed an impregnable front, and having pressed their opponents' goal pretty hard for about half an hour, were successful in placing other two goals to their credit. Towards the end of the game play was getting very loose on the part of the home team, for which they payed dearly by Bonnybridge securing two goals. For the Falkirk team, Leishman, A.Ferguson, and Johnston played well: while James Richardson, as back, was always on the spot, and saved many dangerous attacks. The Bonnybridge team played well, the only name worthy of mention being Paterson (back) who appeared to be in rare form and kicked well. The following are the teams:- Falkirk - Forwards: Leishman, A.Ferguson, Johnstone, A.Smith, Neil, Hamilton; half-backs - Service, Wm.Ferguson; backs - J.Richardson, Smith; goal - D.M'Nair. Bonnybridge - Forwards - Dobson, Irvine, Moffatt, Sutherland, Smith, Mitchell; half-backs - Crombie, A.Paterson; backs - J.Paterson, Forrester; goal - J.Anderson. Throughout the article referred to Bonnybridge, however the village's club was correctly called Grasshoppers. I believe this was the first time Falkirk FC were referred to as the "bairns" in print. Played at stirling on Saturday, and resulted in a draw, each side having scored a goal, the ball being kept in the Stirling ground nearly the whole of the time, during which several shots were made at goal, but owing to the slippery condition of the ground the aim was not certain. Played on the ground of the former, at Bonnybridge, on saturday, and resulted in a victory for the home team by three goals to nothing. On Saturday a match was played in the King's Park between the 1st eleven of the Stirling King's Park and Bonnybridge Grasshoppers. The game resulted in a draw, both teams having secured a goal. After the game both teams adjourned to the Sun Inn where refreshments were served. On the same day the second elevens of the fore-mentioned teams met at Bonnybridge, and had a friendly match, which resulted in favour of the Grasshoppers by three goals to nothing. The match was played during a drenching rain, which rendered play very difficult.